Heads Up SNG and Spin and Gos Discussion of heads up Sit & Go and Spin and Go poker games. Sponsored by HUSNG.com, the leading heads up poker video site. How many games do members of lets say a 30 dollar husng cartel on stars play per day or week on average? Im interested because I want to compare it to what Im playing now 3 tabling the 5.5 dollar ones on party poker. I play around 150 games per day so about 1050 a week and Im "playing" for about 14h daily but about 2-4 of those hours I just sit around waiting for players. this the LB of year to date. hows the field of party poker looks like? i heard that the lobbies are anonymous. does that changes the action? wait what I dont follow, they play 5000 games monthly or since the start of the year? Im a new player so I dont have nothing to compare it to and I only play the 5.5 dollar ones for now and they are just ridicolously soft, I've played around 5000 games and have literally battled one player that is decent( I saw on sharkscope that he is winning 10k) and everyone is else is just an idiot. Every day I get into games with people who open shove almost every hand 75bb deep, a lot of people 3bet huge like I open 2.5x and they raise to 15x. There are some regs but they are also idiot and have really obvious leaks, so far I can't complain although I can't tell you if the lobbies being anonymous changes the action since I have not played when they werent anonymous. hose are the total number of games from the start of the year. do you play hypers, turbos or reg speeds? 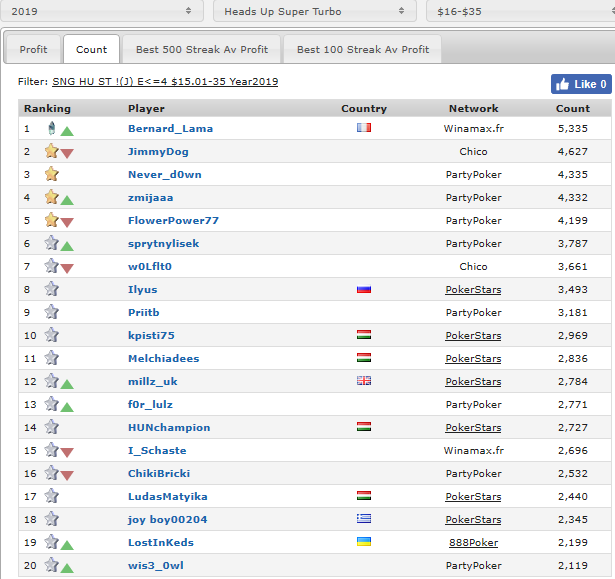 looks like you can get some action on party poker or those are just bots? Definitely not bots but I repeat its at the 5.5 dollar ones I cannot tell you about any other level. I would not be surprised to see more battling withthe rakeback and maybe there isn’t a cartel system so more people just play whoever whenever on PP. I could be totally wrong though. All times are GMT -4. The time now is 05:22 PM.